Dalata is splashing out tens of millions to acquire part of two well-known Dublin hotels. DALATA, IRELAND’S BIGGEST hotel group, has struck a deal to buy a hotel in Portlaoise and acquire parts of two prominent Dublin hotels. 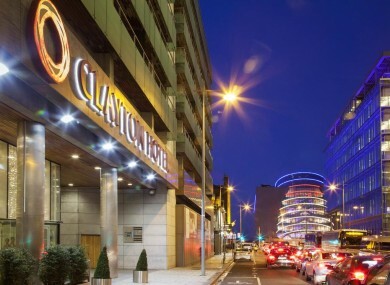 The company announced this morning that it is acquiring the freehold interest of parts of the Clayton Hotel Cardiff Lane on Dublin’s docks and the Clarion Hotel Liffey Valley for €62.5 million from receiver Kieran Wallace of KPMG. Freehold title means that share of the asset is owned outright. Dalata deputy CEO of business development and finance Dermot Crowley said that the move was consistent with the company’s strategy of “buying out the freehold interests of those leased properties with future unpredictable rent reviews”. As part of the deal, Dalata will acquire the freehold of the ground and lower ground floors of the Clayton Hotel, as well as 170 bedrooms. The ground and lower floors contain the hotel’s reception area, a bar, a restaurant, a leisure centre and back-of-house facilities. Once the transaction is completed, Dalata will own 193 of the four-star hotel’s 303 bedrooms. The hotel group already holds a lease on the hotel at a cost of €2.5 million a year – due to expire in 2040 – which is subject to upward-only rent reviews at five-year intervals. Dalata has also agreed to acquire the core of the four-star, 353-bedroom Clarion Hotel Liffey Valley, which is adjacent to the M50 motorway and Liffey Valley shopping centre. The ‘core’ comprises 159 bedrooms, a leisure centre, meeting rooms, the reception, a restaurant, a car park and two vacant retail units. The remaining 194 rooms are owned by individual investors and are not included in this sale. Once the deal is completed, the hotel will be rebranded as the Clayton Hotel Liffey Valley. Dalata already owns several other Clayton hotels. The deal, which is subject to approval from the Competition and Consumer Protection Commission, is expected to be completed by the end of June. The firm also announced this morning that it has struck a deal with receivers Declan McDonald and Ken Tyrrell of PwC to acquire the freehold interest of the Maldron Hotel Portlaoise and the adjoining Midway Foodcourt. The three-star hotel contains 90 bedrooms, a bar, a restaurant, a leisure centre and meeting room facilities. Dalata already holds a long leasehold on the hotel until 2036. The transaction is expected to be completed by the end of this month. Email “The 'Clayton' brand spreads across Dublin as Ireland's biggest hotelier expands”. Feedback on “The 'Clayton' brand spreads across Dublin as Ireland's biggest hotelier expands”.